A full suite of GPU and CPU benchmarks, settings overview, and port analysis. Watch the hell out, monsters: we're coming for you. We've spent the past week benchmarking Monster Hunter: World on PC, testing it on multiple PCs, with 20 graphics cards and 10 processors. The most exciting news is that World has an unlocked framerate on PC, so it's not limited to 30 fps like it is on consoles, or even 60 fps. You can run fully unlocked, though actually breaking into 100fps territory is another matter. It's also a good game, capable of keeping you occupied for many hours beyond the main 20-hour campaign. But enough about the game. Let's talk performance and features. This is the first time a Monster Hunter game has landed on PC, and we're happy to report that it gets many things right from a PC perspective, which is often not the case with console ports. You can unlock the framerate, there are 16 graphics settings available for tweaking, and the game can run on a variety of hardware. The mouse and keyboard controls work fine, though there's some input sluggishness from the mouse if your framerate drops below around 40fps, or you can use a gamepad. There are a few issues, however, as well as some signs of being a console port. There's no option to adjust the field of view, and while the game nominally supports all resolutions, anything that's not 16:9 aspect ratios gets letterboxing—black bars on the sides or top/bottom of the screen. Modding is a bit of a question mark—there's no Steam Workshop support—but there are a few mods elsewhere that tweak aspects of the game, and there's supposedly an ultrawide mod in the works. One big gripe I have is with the Denuvo copy protection scheme, which limits you to running the game on five 'different' PCs per day. It's not entirely clear what counts as a 'new' PC here—any change in CPU core/thread counts registers, while graphics card swaps are apparently okay. However, I've been locked out of the game (several times), because Denuvo "can't validate my purchase"—try again tomorrow. I also had issues getting the game to run on several laptops, again due to Denuvo. Enabling and disabling the Windows Defender Firewall worked on one system, even though the firewall was disabled to begin with. If you're not testing on multiple systems, hopefully Denuvo will be less difficult. Quick recap: here's what Capcom lists as the minimum and recommended system requirements for Monster Hunter: World. Both the minimum and recommended settings are for 30fps, but we'll show below what the maximum level of performance is for the various GPUs we've tested. As our partner for these detailed performance analyses, MSI provided the hardware we needed to test Monster Hunter: World on a bunch of different AMD and Nvidia GPUs, along with AMD and Intel platforms—see below for the full details. Thanks, MSI! Monster Hunter: World offers up 16 graphics settings, though many of them only have a minor impact on performance and visuals. There are also four presets (low, mid, high, highest), and under the advanced settings menu you can adjust the individual items. I've run the 4k, 1440p, and 1080p tests using the highest preset, plus the low and high settings at 1080p. The 'mid' setting ends up performing nearly the same as the 'high' setting, if you're wondering. I've also set resolution scaling to 'high' for all tests, so that 1080p actually renders at 1080p rather than upscaling a lower resolution. For the following performance estimates, I ran the benchmark sequence using a GTX 1070 at 1440p with the highest preset. I then set each option to the minimum allowed setting and tested performance again. Percentage increases are relative to the highest preset, and in a few cases performance goes down. Resolution Scaling: sets the rendering resolution quality, with 'high' being 100 percent scaling. Using a lower setting is like lowering the resolution, though with a blur filter to partially disguise the effect. Dropping to 'low' improves performance by nearly 50 percent, though I don't recommend it. Texture Quality: changes the maximum texture size, though cards with 2GB or more are generally okay—4k and full texture quality requires 4GB VRAM. At '256' (the lowest setting), performance improves by only 2 percent. Possibly useful for slow integrated graphics, but otherwise you can use a higher setting. Ambient Occlusion: sets the quality of SSAO (screen space ambient occlusion) textures, a way of improving shadow quality. 'Off' improves framerates by around 7 percent. Volume Rendering Quality: adjusts the rendering quality of volumetric fog, and presumably lighting as well. This is the most demanding setting (other than scaling), and 'off' improves performance by 30 percent. Turning this off doesn't radically change the way the game looks or plays, so disabling this is a good place to start. Shadows Quality: changes the shadow mapping quality, with low providing a small 2 percent increase. Anti-Aliasing: enables/disables AA, with options of either FXAA or TAA (the latter being preferred). Turning this off improves performance by around 3-4 percent. LOD Bias: adjusts the distance at which LOD (level of detail) models switch. Lower quality models have fewer polygons, and the 'low' setting improves performance by about 15 percent. Slower CPUs appear to see a greater benefit from reducing the LOD Bias. Max LOD Level: sets the maximum LOD level, either to 'no limit' (use all LODs) or '-1' (don't use the top level LOD). The '-1' setting improves performance by around 4 percent. Foliage Sway: enables/disables the swaying of grass and leaves, which might not seem like a big deal, but performance improves by almost 10 percent with this set to 'off'. Subsurface Scattering: a technique to improve the rendering quality of skin, turning this off improves performance by around 3 percent, with no easily visible loss in image quality. Screen Space Reflection: adjusts the quality of dynamic background reflections—meaning, creatures and other objects. This isn't as taxing as in other games (at least for the test sequence), as there aren't a lot of reflective surfaces. Disabling SSR improves performance by about 5 percent. Anisotropic Filtering: AF helps blend between different texture quality levels. These days, most graphics cards can do maximum quality nearly free, and the low setting boosts framerates by only 1 percent. Water Reflection: toggles the dynamic creation of cube maps (higher quality reflections) for water reflections. This can have a greater impact around water, but in the test sequence 'off' only improves performance by 2 percent. SH Diffuse Quality: this is for spherical harmonic lighting, as far as I can tell, which is a way of improving shadows. Despite the lack of details on what this actually does, performance improves by about 12 percent on the 'low' setting, so this is one of the more demanding options. It also appears to have very little impact on visuals, making this another good setting to turn down. Dynamic Range: sets the luminance range to either 32-bit (default) or 64-bit, with the latter being 1 percent slower (with no clear change in quality). Z-Prepass: pre-calculates depth information, and on most modern GPUs this improves performance—older/slower GPUs may perform better with this off, however. In testing, disabling this results in 7 percent slower performance. Cumulatively, going from highest to low quality (without using resolution scaling) you can more than double performance. Monster Hunter: World also needs a lot of VRAM for 4k at highest quality, so on a 3GB or lower GPU as an example, 4k low can run at 32 fps (1060 3GB), while 4k highest is a literal slideshow at 1 fps. 1440p highest even on a 2GB GPU still technically runs okay (13 fps on a GTX 1050), but you may want to limit texture quality to 1024 or lower on 2GB cards. My main test system uses MSI's Z370 Gaming Pro Carbon AC with a Core i7-8700K as the primary processor, and 16GB of DDR4-3200 CL14 memory from G.Skill. I've moved testing of Ryzen processors to the new MSI X470 Gaming M7 AC, also with DDR4-3200 CL14 RAM, and switched to the second generation Ryzen CPUs and APUs. The game is run from a Samsung 860 Evo 4TB SATA SSD for these tests, except on the laptops where I've used their HDD storage. 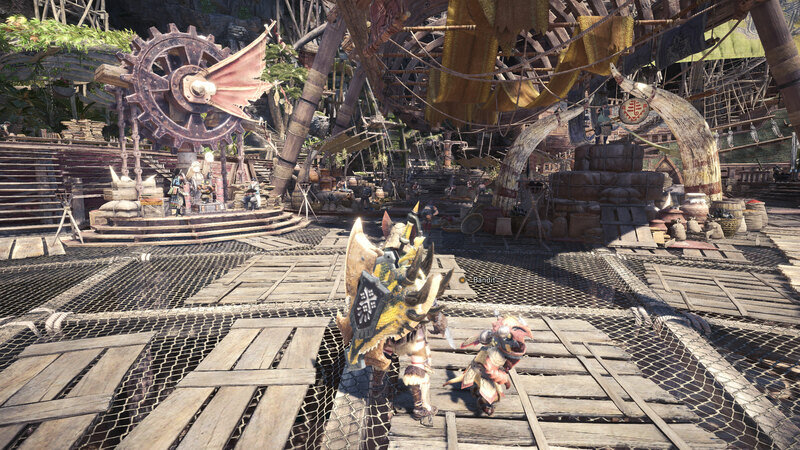 Monster Hunter: World at 4K, highest settings. There's no built-in benchmark, and after checking performance in Astera (the home base) and the Ancient Forest, I determined that the Ancient Forest is more demanding and opted to use that for benchmarks. That makes sense, as the forest is full of wandering monsters and other creatures, all of which need additional AI calculations. The home base by comparison is largely static, and it's also a far smaller area. Testing performance in Monster Hunter is also a pain, in part because changes to many graphics settings require you to exit to the main menu, which can only be done from your main base of Astera. Changing resolutions meanwhile requires a full restart of the game, which is odd considering how many other games manage this without difficulty. The benchmarking process ends up looking like this: launch game, start playing with your chosen save, go on an expedition (in this case, to the starting area of the Ancient Forest)—but if it's raining, go back to the home base and then go on another expedition, as rain causes a noticeable change in performance. If the skies are clear and it's not morning, dusk, or nighttime, run the benchmark. After running the test, return to the base, exit to the main menu, click through the starting screen again, change your graphics settings, and then repeat the above. That's a lot of extra steps, with several unskippable cutscenes that each last 5-10 seconds. But I do it because I love you. And I love numbers and statistics. Whatever. All testing was done during the daytime without rain, for consistency purposes. Another 4K, Highest settings screenshot. For the graphics card benchmarks, I used the fastest CPU I have—an overclocked i7-8700K running at 5.0GHz (see below). This is to show the maximum possible performance of each GPU, whereas running with a slower CPU in some cases would reduce the gap. Here's how the various graphics cards handle the game, with resolution scaling set to 'high' in all tests. Using the low preset at 1080p, the GTX 1070, 1080, and 1080 Ti all bump into CPU bottlenecks or some other limitation. This limit was introduced with the latest drivers, as the previous 398.36 drivers hit 175 fps on the 1080 Ti (but were slower at higher quality settings). AMD's Vega cards are about 10 percent faster than the top Nvidia cards, though if you're after high refresh rates, none of the GPUs manage to break 144fps. Moving down the charts, the 1060 cards lead their AMD counterparts by a small margin, but the GTX 1050 and RX 560 both fail to clear 60fps, even at the minimum quality settings. In other words, Monster Hunter: World on PC needs a decent GPU and CPU to hit smooth framerates. Something else to note is that while Nvidia's 900-series parts appear to do fine (the 970 is a bit slower than the 1060 3GB, which is where it normally lands), the 700-series takes a beating. The GTX 770 barely breaks 30 fps and trails the 1050 by a significant margin. In contrast, AMD's older architecture does fine, with the R9 380 beating the 1050 Ti and the R9 390 matching the RX 570. The high preset is basically the equivalent of the Xbox One X and PlayStation 4 Pro quality, with minor differences. It looks and performs nearly the same as the mid preset, within five percent. Most of the GPUs maintain at least 30fps averages, though the GTX 770 falls short and the GTX 1050 and RX 560 periodically dip below that mark. If you want 60fps, only the 1060 6GB and RX 580 and above will suffice. Yikes. If that sounds damning, keep in mind that the PS4 Pro has a GPU that's very similar to the RX 580 (2,304 processing cores), clocked slightly lower. The Xbox One X meanwhile has 2,560 streaming processors, with slightly higher performance than an RX 580. Neither console can maintain a steady 60fps at 1080p with similar quality settings to the PC's high preset. It's not that the PC version is more demanding than the console version, but rather than Monster Hunter: World in general is a demanding game. At the high and highest presets, AMD's GPUs generally lead their Nvidia counterparts. The Vega 64 and 56 beat the 1080 and 1070, and the RX 580/570 beat the GTX 1060 6GB/3GB. Only the RX 560 fails to claim a win against the GTX 1050. 1080p high also proves a bit much for the Vega 11 Graphics. At the highest preset, even at 1080p, only the Vega 56/64 and GTX 1080/1080 Ti break 60fps. Thankfully, several settings can be turned down without affecting image quality much—and frankly, the game still looks quite good even at low quality (maybe with a few tweaks to AA and texture quality). Unfortunately, if you were hoping for markedly better visuals than the latest consoles offer and a smooth 60fps, that's not happening. The graphics are perhaps slightly improved, but you need a top of the line graphics card if you want to max out the settings without dropping to 30fps. Moving up to 1440p with the highest preset is only advisable if you have a GTX 1080 Ti or other similarly potent hardware. The 1080 Ti barely breaks 60fps on average, and everything else comes up short. Dropping to the high preset doesn't really change the image quality much and improves performance by nearly 50 percent, so that's the easiest way to improve the situation. As is often the case, maxing out image quality at 4k isn't realistic right now, and I doubt even the upcoming RTX 2080 will change that. Performance is about half of what you get at 1440p, and the 1080 Ti is the only GPU to break 30 fps. If you prefer resolution over image quality, however, you can nearly triple your framerates by running at 4k and the low preset. I prefer a combination of image quality and resolution, which is why 1440p remains the sweet spot for high-end monitors. Meanwhile, if you're only looking for 30fps at 4k, the GTX 1060 3GB and above can get there using the low preset. This one's a Capcom screenshot. 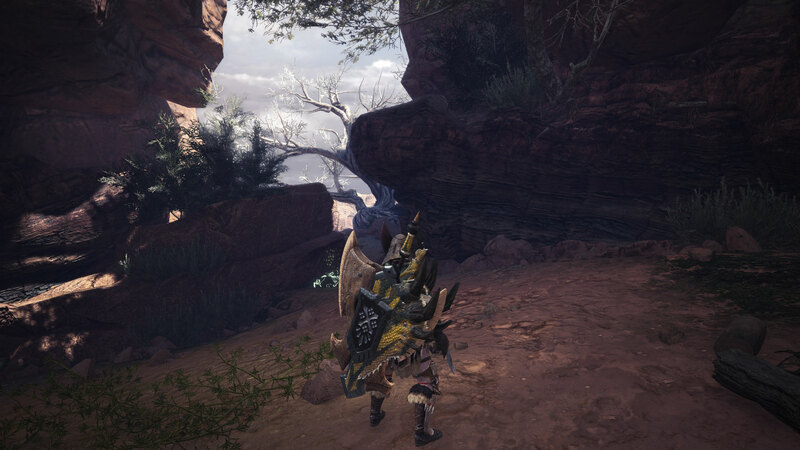 If you're after maximum framerates, Monster Hunter: World requires a potent CPU. I've only tested with modern AMD and Intel CPUs, but 4-core/4-thread parts like the i3-8100 (and by extension, i5-7400 and similar) can bottleneck graphics card performance with high-end GPUs. My colleagues also played the game on some other CPUs and found that 2nd and 3rd generation Intel parts can really struggle. If you plan on running at higher quality settings and higher resolutions, your CPU won't make quite as much of a difference, but 6-core processors and above still provide the best performance. At 1080p Low, where the CPU makes the biggest difference, a few things become apparent. First, Monster Hunter: World really likes having a lot of cores/threads—AMD's Ryzen processors outperform similarly priced Intel parts thanks to the extra cores and threads, even with lower clockspeeds. Meanwhile, the i3-8100 and i3-7100 really tank performance, and by extension the 4th gen and earlier Core i3 and i5 CPUs (and AMD FX series processors) will struggle to hit 60fps, regardless of your GPU or settings. 1080p high puts more of the workload on the GPU, but the slower CPUs like the Core i3 and Ryzen 3 still create a clear CPU bottleneck. At 1080p highest quality, the bottleneck shifts toward the GPU, even with a 1080 Ti. Interestingly, Intel's i5 and i7 Coffee Lake parts also move ahead of the Ryzen 5/7 CPUs, though I'm not quite sure why. The rankings of the CPUs don't really change at 1440p and 4k highest quality settings, with the GPU limiting performance on most processors. One thing I do want to mention is that below 40 fps, the mouse input and smoothing starts to feel a bit off. The game remains playable, and you could even slog through things at 20fps if you're not too picky, but personally I try to keep things above 40fps for the best experience. Given that notebooks are more power constrained and often clock the CPU lower, plus the fact that these are all previous generation notebooks (ie, 7th Gen 4-core/8-thread Core i7 processors), the desktop GPUs look quite a bit faster at lower quality settings. Normally, the desktop cards are only 5-15 percent faster, but at the low preset even a GTX 1060 6GB card beats the mobile GTX 1080, thanks to the CPU performance deficit. CPU bottlenecks are especially apparent as the notebooks are limited to 1080p in most cases. Things are more or less what we normally would expect to see at the highest preset, but now only the GTX 1080 can average 60fps, and even then it dips below that mark on a regular basis. The good news is that the high preset or alternatively a mix of low to high settings will get all three notebooks into smooth 60fps territory. As you can see, aside from time of day and NPC positions, the main difference between the low and highest preset is the lack of fog. Some might even consider that a benefit. The differences between the mid, high, and highest settings are even more difficult to notice, so if you're playing on medium, you're not missing out on much. Thanks once again to MSI for providing the hardware for testing. These results were collected in early August 2018, using the initial version of the game with the latest graphics drivers available at the time (Nvidia 398.82 and AMD 18.8.1). As the first Monster Hunter game to arrive on PC, Monster Hunter: World is a reasonable port of the console game, but with some performance oddities. Capcom stated that the goal was visual parity with modern PS4 and Xbox One consoles, though exactly what that means is another matter. The PS4 and Xbox One don't always render things the same, never mind the PS4 Pro and Xbox One X. For example, PS4 renders at 1920x1080 while Xbox One renders at 1536x864 (and upscales to 1080p). The PS4 Pro bumps the rendering resolution to 3200x1800, while the Xbox One X renders at 3072x1728—and both use upscaling to 4k. Other modes in the enhanced version tweak the settings and render at 1080p, but the problem is that resolution scaling and other graphics settings are basically hidden away on consoles. On PC we have more control over such things, but it's still difficult to make an apples to apples comparison. In terms of performance, the PS4 runs at 30-ish fps (20-40 fps depending on the scene) and the Xbox One is closer to 25-ish fps (20-35 fps). Both stutter at times due to the sub-30 fps that routinely shows up. Even on the PS4 Pro, the high performance mode only hits about 42 fps on average, while the Xbox One X is a bit higher (45-ish fps). If you go with 'prioritize graphics' you're getting an experience close to the PC's high setting, but framerates are down around 30 fps. It's a bit crazy to see even the fastest gaming PCs struggle to hit 60fps in many cases, but when you consider that even the latest consoles often fall to 30fps at 1080p, it's not fair to label this a poorly executed console port. 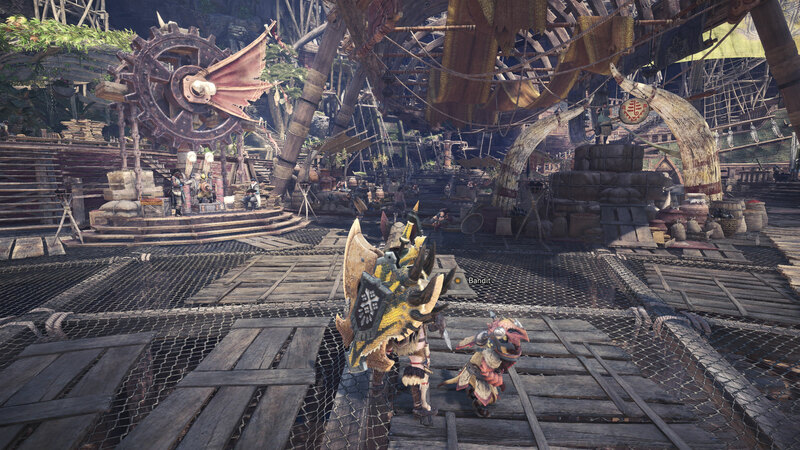 The Monster Hunter: World environments are complex and often beautiful, and rendering that world requires a lot of hardware. Consoles get more out of their hardware by being tuned for a specific platform, but the Jaguar CPU cores in the Xbox One and PS4 are roughly one third the performance of a modern Intel core clocked at 4.0GHz. That means eight Jaguar cores is less than four Intel cores, and that explains why a 4-core PC processor sits around 50-60 fps while the consoles are in the 35-45 fps range. Monster Hunter: World is still has the same incredible co-op as when it first launched on consoles earlier this year. While the PC version appears to be missing the loads of free DLC the console version have accrued in the meantime, everything else appears to be intact. For co-op, Monster Hunter: World offers a nice option in its menu: "Copy Session ID." This drops a code like "3pseaHNaZrB" into your clipboard, which you can share to invite other players to your hunt once you've setup an online session. We tried this out and it worked easily, though there are some elements of MHW's online structure that remain confusing. Once we got in a session together, the game performed flawlessly, with no lag or other issues. We did find the in-game voice chat to be quiet and low quality, and after a few minutes switched over to chatting on Discord. Much better. Here's another nice touch: you can pick a Steam group to show off, and it'll display that group's icon next to your name. PC Gamer represent! 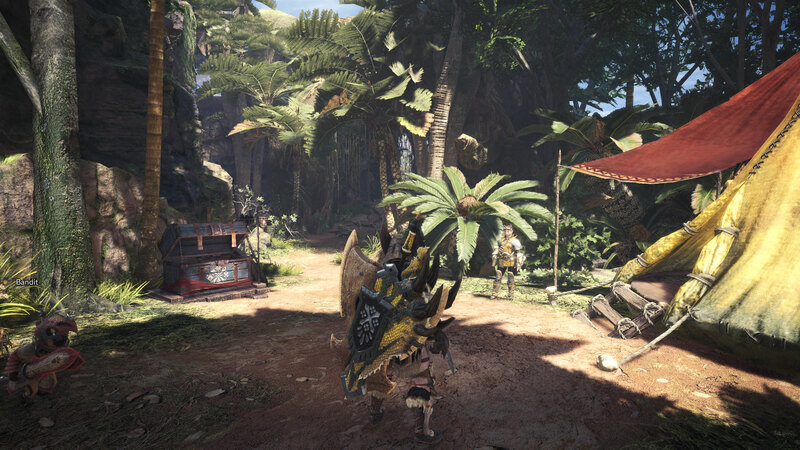 If you're looking for smooth gameplay, the PC version of Monster Hunter: World has the advantage of providing a lot more control over the graphics options. You also have plenty of options for faster hardware, if you care to throw money at the problem. With a decent PC you can lock in 60fps by dropping a few settings, whereas on consoles that's not really an option. There's also potential for future patches and optimizations to help the PC version stand out more, though that's more likely to come via mods than via patches. 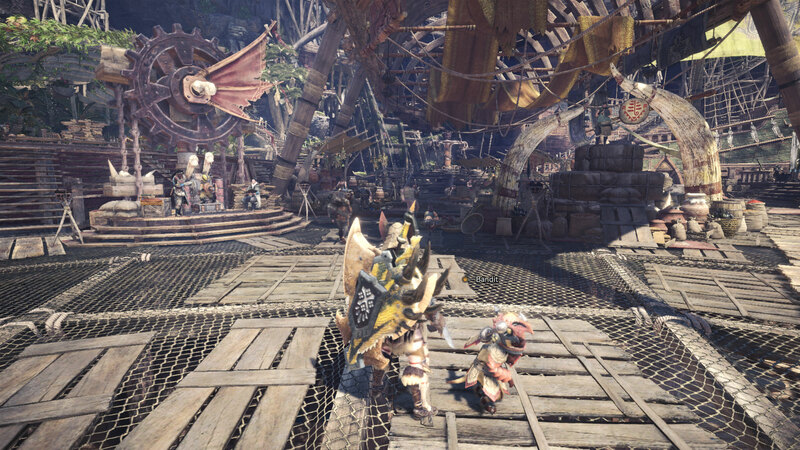 If you're looking to get into Monster Hunter: World on PC, the good news is that it can be played at 30fps even on older hardware. If you're used to 60fps gaming, however, plan on 1080p and lower settings, or bring some beefy hardware to the party. That's not as bad as it might sound, though, because even at medium quality the game looks quite good.